In a Nutshell: Modern businesses need new hires to arrive on the job ready to contribute. 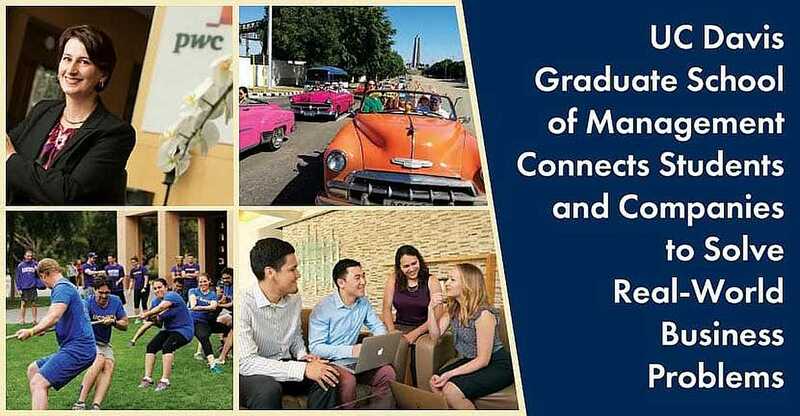 With that in mind, the UC Davis Graduate School of Management gives MBA students the opportunity to develop the hands-on experience they need to hit the ground running. The school’s Integrated Management Project immerses student teams in a 10-week strategic program, tackling a partner company’s “real-world” business challenge. As part of the school’s IMPACT curriculum, the required capstone project has MBA student teams putting their skills to work to produce impactful solutions for clients ranging from Fortune 500 companies to Silicon Valley tech firms. UC Davis has also launched a year-long graduate degree program to give students first-hand experience in the growing field of business analytics. The Graduate School of Management has developed all of these initiatives to help students master the skill sets they need to make a positive difference in business right away. A decade ago, the UC Davis Graduate School of Management’s curriculum renewal process turned out to be anything but routine. Alumni, recruiters, and the companies where graduates worked agreed that the school had a strong core academic curriculum, but needed to provide MBA students with more practical, hands-on experience in a business environment. In response, UC Davis introduced the MBA Integrated Management Project. The 10-week team project immerses students in a real-world business scenario and asks them to analyze and solve a sponsor company’s problem. The issues are from areas such as strategic planning, operational analysis, market opportunity assessment, and organizational effectiveness. Joe DiNunzio is the Faculty Director of the IMPACT program at the UC Davis Graduate School of Management. So far, UC Davis MBA student teams have helped Google validate the software value equation for enterprises moving to a multi-cloud world, worked with Chevron Energy Solutions on positioning strategy, enabled Sutter Health to survey the future landscape of millennial healthcare, and created a framework to measure the progress of Johnson & Johnson’s sustainability initiatives in the medical device and diagnostics business. The MBA Strategic Projects at UC Davis anchor the IMPACT curriculum as a 10-week capstone course where student teams work to solve business challenges for sponsoring organizations — including Fortune 500 companies, major players in the agriculture and healthcare industries, and Silicon Valley tech firms. IMPACT Faculty Director Joe DiNunzio said the partnerships benefit the students, sponsor companies, and UC Davis. The IMPACT (Integrated Management Project Articulation and Critical Thinking) curriculum puts academic learning to the real-world test, and the project course is designed to accomplish three objectives. UC Davis approaches the projects as a business operation. The Graduate School of Management corporate relations team works year-round to identify possible client sponsors and keeps a running list of 200 potential firms. They remain in routine contact with the organizations, similar to business development professionals at a for-profit company. At the start of the academic quarter before IMPACT, students take a survey on their project interests — both functionally and by industry. UC Davis uses the survey results to target the organizations among the 200 firms that best match student skills, interests, and aspirations. In a typical academic quarter, 10 to 12 six-member student teams complete an Integrated Management Project (IMP). Joe said the businesses have to present a challenge in the “Goldilocks zone,” meaning something demanding and also of significant value to the company, but not too broad for a student team to approach successfully over 10 weeks; developing a precise project scope is an important part of the IMP process. Faculty advisors closely guide the team’s process from start to finish and bring a range of consulting and industry experience in the business world as well as in academic research and teaching. As with the MBA students, the companies also need to make a commitment. A C-level executive or general manager with budgetary authority is involved, as well as an executive who will be in routine contact with the student team. The company also becomes a Business Partner of the Graduate School of Management, providing recruiting and networking opportunities, as well as university-wide resources. Students sign a contract with the company that details their work process and deliverables. They have weekly contact with the client, take part in ad-hoc discussions, and give three presentations during the course of the project. In the final week, they present their findings to the client, with analyses, projections, and recommendations. “This is, ultimately, a student-led project, and they’re responsible for defining and delivering the results,” Joe said. The success rate is impressive, as more than 80% of the client companies adopt the recommendations of their IMPACT team. UC Davis’ Master of Science in the growing field of business analytics also provides students with the opportunity to immerse themselves in real-world business problems. The retail, finance, and insurance industries are increasingly using data to guide business decisions, and the analytics market is projected to rise from $44.5 billion in 2015 to $71.1 billion by 2022. As the field of data analytics booms, more and more universities are offering programs to train students for the profession. Launched last fall, the UC Davis MSBA blends classroom learning in business and data science with a year-long project in collaboration with industry partners and drawing on the deep expertise at UC Davis. The hands-on business analytics project pairs a five-member student team with a corporate partner’s analytics department to give students the opportunity to move through the consulting spectrum from simply providing information to building the trust necessary to make sustainable change in the client organization. MSBA student Sonic Prabhudesai leads a team providing business intelligence and deep analysis to Charles Schwab’s Retail Business. These in-depth projects last the full length of the Master of Science program, so students gain the experience they need to be ready to create business value and enable data-driven business transformation. Ten years ago, alumni, recruiters, and employers told the UC Davis Graduate School of Management that its students needed more hands-on experience to bring to the workplace. UC Davis invested two years redesigning its MBA curriculum and launched the IMPACT curriculum, anchored by Strategic Projects to give students hands-on experience in solving real business problems. With this mix of classroom and corporate consulting experience, recent UC Davis MBA graduates enjoyed a 91 percent placement rate within three months of graduation. Future business leaders who have completed a Strategic Project course said they developed mutual respect and trust for their teammates and developed skills managing client expectations, thinking nimbly, negotiating, and adapting to unexpected situations. More recently, students in the charter Master of Science in Business Analytics class are working on Big Data problems for several technology, finance, healthcare, and retail companies. In addition to developing top-notch business managers, UC Davis continues to build strong relationships with the Fortune 500 and technology companies that serve as sponsor clients. Those partnerships enhance the school’s profile and give students in edge in networking and career opportunities.